With Summer officially being here, MONARCH magazine would like to celebrate by paying tribute to the music industry’s influence on lifestyle, business and society. Music star power is the theme for this issue. A driving force within the lifestyles of not only African- Americans, but with most people in our country. People seek music as an outlet to depict our state of mind, justify our emotions and to express ourselves. As we venture into the upcoming summer months, we have a chance to step back and take a look at how our culture has been intensely influenced by music. Throughout our lifetime, musicians have influenced how we live, what we buy and what we do. The summer issue of MONARCH makes known that the influence of music has not only impacted culture, but has quickly become a major branding platform. Now many corporations are tapping into music’s power via live summer festivals and arena concerts, targeting their audiences with strategic product placement and social media. Brands fused with artists become a simple formula that bears amazing results. Rather than solely focusing on what’s currently topping the charts, this issue explores how over time music has affected our entire world. With that, it is impossible to recognize the impact of Music, without paying homage to its icons. 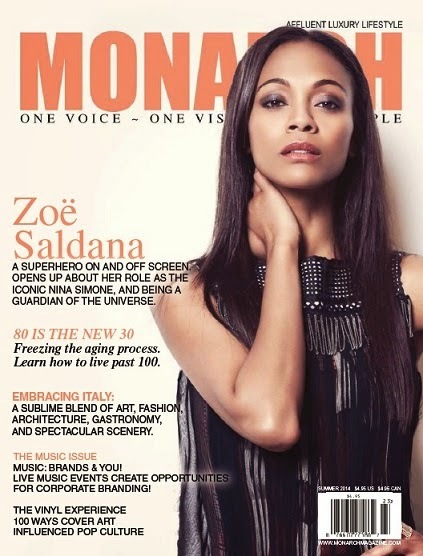 MONARCH sat down with the amazingly talented actress, Zoe Saldana, known for her roles in Avatar and Star Trek. Zoe discussed her decision to take on the controversial role of a musical legend Nina Simone, a pioneer in music and civil rights activist, who used her unique sound and sincere passion to pave the way for social change. Ultimately, music bonds millions of people whether it’s at home, in the car or at a festival. This latest issue of Monarch will be your source for who to listen to and where to find them this summer. This issue also features Pharrell Williams, Frank Ocean and South African songstress Lira. Readers can find the summer issue of Monarch online and on newsstands this summer.